“A florist is not just a person who makes pretty flower arrangements..."
Fragrances of roses and carnations filled the air as Myeon Oh, owner of OhMyeon Flower Art Institute, explained the essence of flower art and arranged flowers meticulously in a colorful bouquet in front of his class of North Korean women defectors. The beauty of the scene is deeper than the simple stunning arrangements. Such an opportunity to watch the florist and create arrangements of their own is an experience these women would have never had in their previous lives. 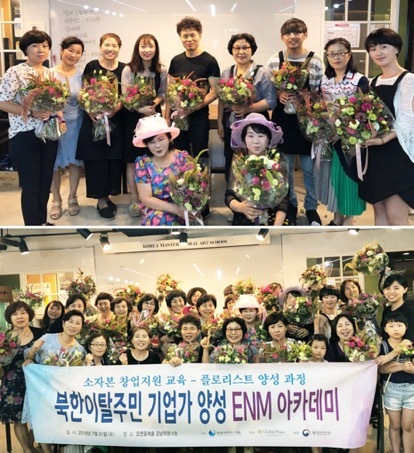 The florist class took place in July 2018 and was part of a series of professional technical training courses within the multi-year program, North Korean Defector Entrepreneurship Training ENM – Small Capital Start-up Academy. Global Peace Foundation (GPF) and Action for Korea United (AKU) were co-organizers of the program with the Ministry of Interior and Safety sponsoring the program since 2016. The start-up support academy provides technical skills and business management training for North Korean women defectors seeking to start businesses of their own, giving them a rare opportunity to find footing in a world so drastically different than the one they once knew. The florist course covered an overview of the florist industry, distribution and management, and hands-on experience in arranging flowers. 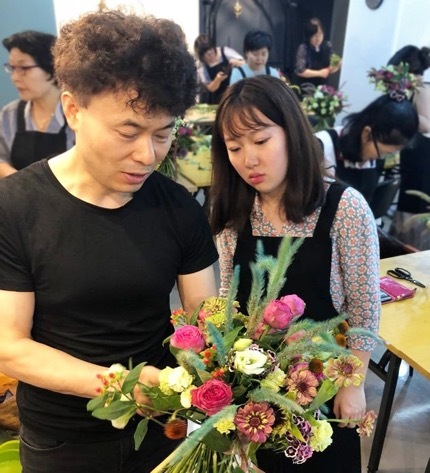 Ms. Mi-hwa Kim, President of the women's division of GPF Korea, said to the participants, “We offered this florist class to help you achieve economic stability in South Korea. If this class sparked your interest in flower art, I encourage you to get a certificate to achieve your dreams as a florist.” Ms. Kim also encouraged the class to participate in the upcoming Korean cuisine course. The challenges of adjusting to everyday life in the South are undeniable for North Korean defectors, and the cultural and social differences they encounter in the South do not make starting a business any easier. GPF Korea and AKU are helping these women defectors build confidence as they dare to dream about new possibilities for their future and rebuild their lives with a sense of belonging and an entrepreneurial spirit. Prior to the divide of the Korean peninsula, the people of the North and South had lived as one people with one culture for the thousands of years of Korea’s history. AKU is reviving this shared history in the consciousness of the Korean people and drawing attention to Korea’s most noble ideals and values to form a common identity and vision for a unified Korea.